Demolition work is much more complicated than it seems, especially in New York. You need to obtain demolition permits, use the right equipment and you may even need to perform a hazardous material abatement. Don't let the hassles involved with demolition delay your project. Call in the experts at Pinnacle Demolition And Environmental Services for demolition work. We specialize in turn-key demolition services in the Whitestone, NY area. Our service area includes all of New York City, Queens, the Bronx, Brooklyn and Manhattan as well as Long Island, New Jersey and Westchester. We work directly with real estate developers, property managers and international investors to tear down residential, industrial and commercial structures. Reach out now to start clearing the way for your construction project. 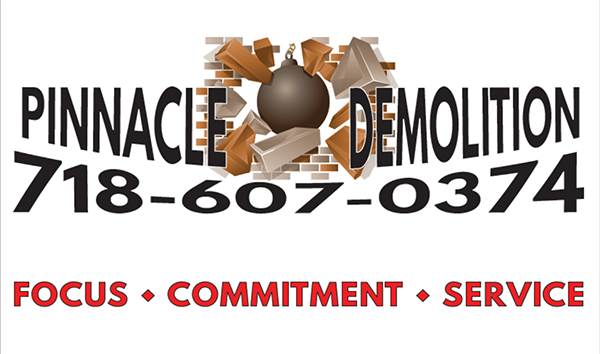 Talk to us about your demolition project today. We'll take the time to understand your needs so we can surpass your expectations. No demolition project is too big or too small for us. We can knock down a single building or an entire city block. We have the equipment needed to tear down homes, warehouses, industrial facilities, office buildings and apartments in and around Whitestone, NY. That includes getting rid of mechanical equipment, concrete and asphalt. Call us now at 718-357-0011 for a free estimate. Pinnacle Demolition And Environmental Services is an experienced and fully insured company based in Whitestone, NY. We use our own equipment. Don't worry if your demolition site is in a high-density area-we have the expertise to complete every demolition project safely. Contact us today to transform tired old properties into sought-after spaces. Pinnacle Demolition and Environmental Services was very professional. They demolished an existing storefront for us. The project was completed in a timely manner, and the area was cleaned up afterwards. I wanted to demolish a 15 ft. long by 2 ft. high book case bolted to the wall, and Pinnacle did a very amazing job! They responded to my inquiry in an instant and were always on time all throughout the demolition. They cleaned up everything, and it was all done efficiently. The price was reasonable. Everything in the contract was explained to me. This company is really awesome! I recently bought a home that was a fixer upper and needed several things demolished/removed. Pinnacle quickly responded and worked according to our agreed upon timetable. I wanted to have this done ASAP, and they maintained a sense of urgency throughout the entire project. They removed kitchen cabinets/appliances, old attic insulation approximately 20 ft x 34 ft in area, two plaster bedroom closets approximately 4 ft x 3 ft in area, the garage ceiling, some bathroom tiles, and a small section of kitchen wall. They also removed the front chain link fence/hedges. I couldn't have asked for better service. They knew exactly what to do and got it done quickly. The crew was hardworking and respectful, and the results are beautiful. It was a 1.5-story building that needed to come down, and Pinnacle Demolition gave me the best bid. It was a tough job, and they needed some time to demolish everything. They were consistently great. I can't say enough good things about them. They really went the extra mile and saw things through. That's why I won't hesitate using them again in the future. I had a building and canopy which I wanted to be demolished, without the basement. Pinnacle Demo was highly professional and they did an excellent job. They finished the project ahead of time and left the area very clean. I had some interior demolition work done at a dry cleaning building Pinnacle did a perfect job! Frank Roma was the one I worked with, and I was really impressed with his professionalism. He was very responsive and efficient. I am looking to have a few walls and a subfloor demolished in our new studio complex. We went with Pinnacle Demolition to remove the cinderblock walls, drywall, and 1100 sq ft of subfloor. The scheduling worked out well. They came on time and finished in a quick manner. The cost was exactly what they said it would be as well. I was really satisfied with the service they provided. We have a 4000 sq. ft building in Brighton Beach area and we need to have the 3 ft high off the floor sheetrock removed. We went with Pinnacle Demo who did really great work. They were quick to respond and the job was done that day. I was satisfied with them. Our In-ground granite pool got demolished. We hired Pinnacle for the job and they did it well. They were a professional crew and handled that pool with ease. Pinnacle Demolition and Environmental Services did an excellent job. They are capable of really expediting the service. Others are fast, but they were super fast. Plus, Frank Roma is very cordial; he's easy to communicate with. He is out there before the day starts and still there even after the day is over making sure that everything is fine. I highly recommend him and his company.